Why is Novarnica so effective? The secret is in nature. Did you know that this beautiful flower, ARNICA, has extraordinary properties? 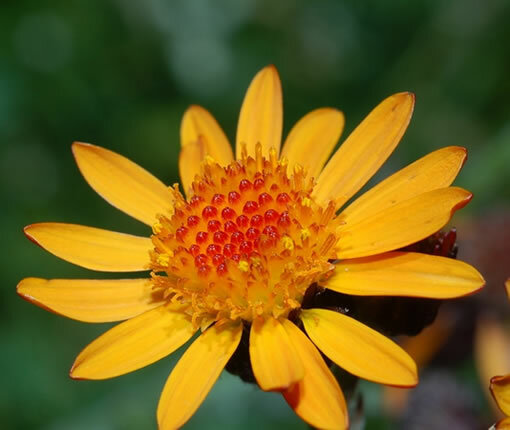 The Arnica Montana has been used for medicinal purposes since the 1500’s and is still popular today. Applied to the skin as a cream, ointment, liniment or tincture, Arnica is used to relieve muscle pain, reduce inflammation and heal some wounds. It is commonly used for sprains and bruises. Arnica is generally applied topically (on the skin). The Arnica montana is a European flowering plant in the sunflower family. It is noted for its large yellow flower head and can grow up to almost two feet in the mountainous regions of Europe and western North America. American arnica species include A. fulgens, A. sororia, and A. cordifolia. In Europe, A. chamissonis is cultivated in addition to A. montana to fill the demand for the estimated three hundred arnica-containing tinctures, ointments, and homeopathic remedies manufactured for the German market. Dried orange-yellow flower heads supply a therapeutic volatile oil, that contains fatty acids, aromatic terpenes, flavonoids, tannins, and sesquiterpenes of the helenalin type. Medicinal Uses. Arnica soothes sore muscles and reduces pain and inflammation. Europeans and Native Americans, who referred to arnica as mountain tobacco and leopard’s bane, used it for sprains, bruises, and wounds. Eclectic physicians, alternative medical practitioners of the late nineteenth and early twentieth centuries, recommended it for contusions and bruised muscles, mastalgia, and chronic sores or abscesses. Rubbed on the head, arnica tincture was said to stimulate hair growth. Some physicians recommended internal use for depression, dyspnea, typhoid, pneumonias, anemia, diarrhea, and cardiac weakness. Studies. The Commission E reports that when applied topically, arnica preparations have antiphlogistic (anti-inflammatory) activity. In cases of inflammation, arnica preparations also show analgesic and antiseptic activity. In vitro experiments concluded that helanalin also works as an immunostimulant (Leung and Foster, 1996).